Definition: Adrenal Insufficiency (Addison’s Disease) is a disorder that occurs when our body produces insufficient amounts of certain hormones produced by our adrenal glands. In Addison’s disease, our adrenal glands produce too little cortisol and often insufficient levels of aldosterone as well. Adrenal Insufficiency or Addison’s Disease occurs when the adrenal glands do not produce enough of the hormone cortisol and in some cases, the hormone aldosterone. For this reason, the disease is sometimes called chronic adrenal insufficiency, or hypocortisolism. The disease is characterized by weight loss, muscle weakness, fatigue, low blood pressure, and sometimes darkening of the skin in both exposed and non-exposed parts of the body. Treatment for Addison’s disease involves taking hormones to replace the insufficient amounts being made by our adrenal glands, in order to mimic the beneficial effects produced by our naturally made hormones. Aldosterone keeps the sodium and potassium in our blood balanced, which helps control our blood pressure and the balance of fluids in our body. 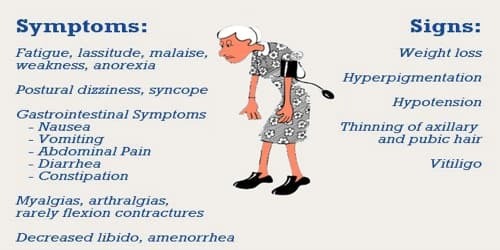 Causes and Types of Adrenal Insufficiency: Causes of acute adrenal insufficiency are mainly sudden withdrawal of long-term corticosteroid therapy, Waterhouse-Friderichsen syndrome, and stress in people with underlying chronic adrenal insufficiency. The latter is termed critical illness-related corticosteroid insufficiency. 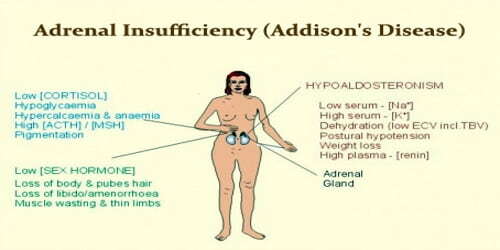 Primary Adrenal Insufficiency – Primary adrenal insufficiency is also called Addison’s disease. It is due to impairment of the adrenal glands. When people have this type, their adrenal glands are damaged and can’t make the cortisol they need. They also might not make enough aldosterone. Bleeding into the adrenal glands, which may present as an adrenal crisis without any preceding symptoms. 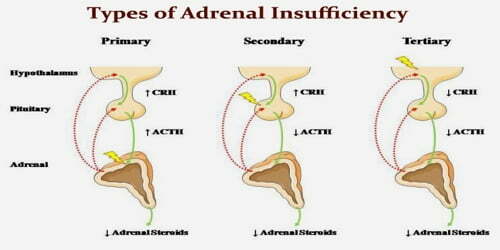 Secondary adrenal insufficiency – This form of Addisons disease can be traced to a lack of ACTH, which causes a drop in the adrenal glands production of cortisol but not aldosterone. A temporary form of secondary adrenal insufficiency may occur when a person who has been receiving a glucocorticoid hormone such as prednisone for a long time abruptly stops or interrupts taking the medication. Tertiary adrenal insufficiency is due to hypothalamic disease and a decrease in the release of corticotropin-releasing hormone (CRH). Causes can include brain tumors and sudden withdrawal from long-term exogenous steroid use (which is the most common cause overall). Signs and Symptoms of Adrenal Insufficiency: The adrenal glands, located above the kidneys, secrete many hormones essential for the body’s normal functions. People with adrenal insufficiency do not produce enough of two vital hormones, called cortisol and aldosterone. The symptoms of adrenal insufficiency usually begin gradually. ACTH Stimulation Test: This is the most specific test for diagnosing adrenal insufficiency. Blood cortisol levels are measured before and after a synthetic form of adrenocorticotrophic hormone (ACTH), a hormone secreted from the anterior pituitary is given by injection. Insulin-Induced Hypoglycemia Test: A reliable test to determine how the hypothalamus and pituitary and adrenal glands respond to stress is the insulin-induced hypoglycemia test. In this test, blood is drawn to measure the blood glucose and cortisol levels, followed by an injection of fast-acting insulin. Blood glucose and cortisol levels are measured again at 30, 45, and 90 minutes after the insulin injection. The normal response is for blood glucose levels to fall and cortisol levels to rise. Oral corticosteroids. Hydrocortisone (Cortef), prednisone or cortisone acetate may be used to replace cortisol. The doctor may prescribe fludrocortisone to replace aldosterone. Corticosteroid injections. If people are ill with vomiting and can’t retain oral medications, injections may be needed. People take these medicines regularly to treat diseases such as rheumatoid arthritis, ulcerative colitis, or asthma. The drugs act like cortisol in your body. When their body detects them, it senses that cortisol is present, so their pituitary gland doesn’t make as much ACTH to prompt their adrenal glands to make more. Women with primary adrenal insufficiency who become pregnant are treated with standard replacement therapy. If nausea and vomiting in early pregnancy interfere with oral medication, injections of the hormone may be necessary. 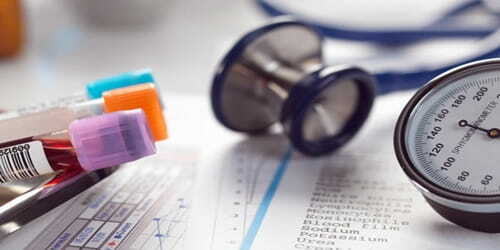 An Addisonian crisis is a life-threatening situation that results in low blood pressure, low blood levels of sugar and high blood levels of potassium. This situation requires immediate medical care.